Luminox 0301.BO Sea Turtle 0300 men's watch features a 39mm wide and 12mm thick black carbon compound case with a unidirectional rotating bezel and textured double-security gasket push-pull crown. Luminox 0301.BO is powered by Swiss Made quartz movement. This stylish watch features a sharp looking black dial with orange T25 tritium night vision tubes accents black luminous hands and Arabic numeral hour markers along with the 12/24-hour time and date display functions, scratch resistant hardened mineral crystal and water resistant to 100 meters. Luminox 0301.BO is equipped with a 19mm wide black silicone rubber strap with a buckle clasp. 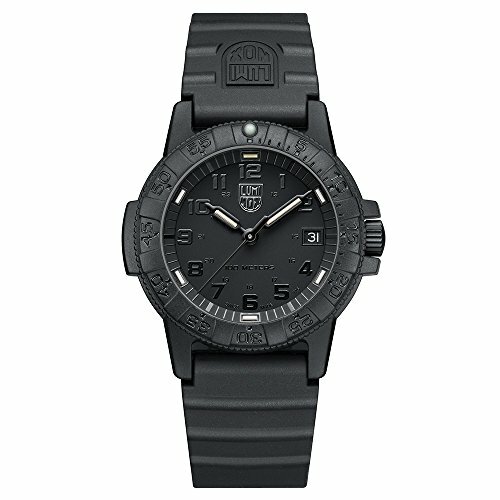 Luminox 0301.BO men's Sea Turtle 0300 black strap Swiss watch is brand new and comes in an original Luminox gift box and is backed by a 2 year limited warranty.